Weather outside frightful? No way. I had just finished describing to someone how much I enjoy the changing of our distinctively different seasons here in the northeast part of the country when I decided that I would meet up with Patty in the city (Philly, that is...if you're not keeping track) and head over to The Khyber for their fund-raising firkin event. Well, this was after checking both Amtrak's and SEPTA's morning "performance" to see how delayed service was running into the city. Oh, and that in fact came after hearing, or shall I say seeing, online from The Khyber's Jeremy Thomson that the event would go on. This was, after all, a state of emergency as he put it. One that would raise needed funds for the animals. Actually, what I found in the city was that much continued to go on. That's part of the beauty of urban living, not being so dependent upon cars to get through daily life. In the city, there are trains, buses, subways, trolleys, and cabs to get from point A to point B. Plus, there's good ol' fashioned pedi-power. We combined a few of these to find our way into Old City and a bar seat at The Khyber. We were there for the first couple hours of the event when things were still a bit slow. But, I can recall how things went for us when we used to live in the city and predict how the remainder of the day went. 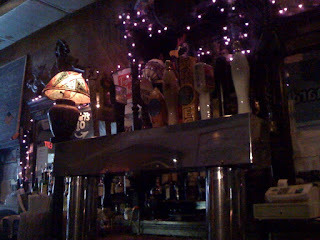 After slumbering through a wintry morning, grabbing coffee and breakfast/brunch, urbanites in search of good beer for a good cause were lumbering in the direction of The Khyber to put back from Sly Fox Chester County Bitter, Yards George Washington Porter, Philadelphia Brewing's Shackamaximum Stout, and Stoudt's Fat Dog Stout on cask. There were unlimited refills of these four beauts included in the $20 donation to Philly PAWS; but even at one glass of each of them you were right around breakeven. Note to brewers and bar owners/managers: These cask events don't pop up nearly often enough around these parts. We here in the Philadelphia region were one of the early adopters of a strong cask culture. Still...While most bars of above average repute have around one beer engine, I think I speak for many of us who would like to see more cask offerings and more at one given time at events such as this. Brewers--Bar Managers....Possible? Readers....what say you? 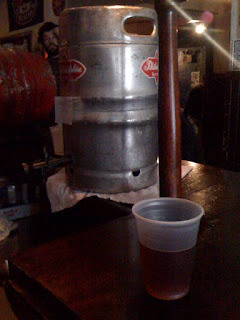 We're thinking of starting First Firkin Fridays at Dock Street.... or something like that. Keep your eyes out! sounds like a great way to start the weekend...keep us posted!